For many of us, life is filled to the brim. Commitments, activities, relationships and to-do lists take a lot of our time and energy (often in wonderful ways! )—especially as we are preparing for Easter. As you pack Easter baskets for children and friends, have you stopped to think about what’s in your Easter basket? We all need a pause now and then—an opportunity to be still and allow our Creator to fill us up with His goodness and love. The Easter season is a wonderful time for this, as we begin to reflect again on the sacrifice of Jesus and all that His resurrection means. As we look forward to Easter Sunday, we’ll likely be planning celebrations and filling baskets. But how are we preparing our hearts for Easter? Let’s consider how we might pose the question: Am I ready to empty my basket and allow God to fill it? Is my heart ready to pour into others as Jesus did? If not, how can I prepare for a beautiful experience of His love and grace? Sometimes, it’s helpful to step away from our everyday environment for some time alone with God. Sure, He is always with us and we can talk with Him all day long. But just like a spouse or a dear friend, it’s nice once in awhile to let go of all we are doing in that moment, and completely focus on that cherished relationship. Create a space to sit down with Him; It doesn’t have to be fancy or complicated—just something that speaks to your heart and comforts your spirit. Maybe it’s a chair by a window or some big cushions in a cozy corner. Light a candle and prop or hang up a sacred reminder of His presence. Whether it’s a few minutes or hours, your visits to that place can become a sweet connection amidst the daily rush. What am I doing right now in my life that I truly feel called to do? What am I doing because I’m afraid to say no? What things might God be nudging me to let go of? How is he calling me to be a vessel for His love in the coming days? Then ask God to give you the courage and wisdom to take steps in response to your answers. What’s one way you don’t normally seek a connection with God? Sometimes switching things up can open us to a wonderful new experience of Him. Maybe it’s a short daily prayer walk, sacred song or dance. If you haven’t tried Bible journaling, it’s a unique and creative way to encounter the Word. Consider one of our Illustrated Faith devotional kits and discover a brand new way to appreciate the gifts He has given us and grow in His Word. What are those well-worn paths in your everyday life? Do you spend a lot of time at the kitchen sink? Sitting in a cubicle? Taxiing kids everywhere? Find some little ways to point yourself toward Jesus throughout the day. Maybe you decorate seven note cards with the fruits of the spirit or set up a perpetual calendar to change each day. Use a mug with a message for your favorite daily drink or keep a devotional in the car for parking lot time. Finding simple ways to become aware of God’s presence will become a thread of joy that runs all through the season. So as we enter the coming weeks, let’s each take some time to fill up in our own way with His joy, hope and peace. Whatever you choose to do, may it be something that not only fills your heart, but allows you to pour into others as Easter arrives. 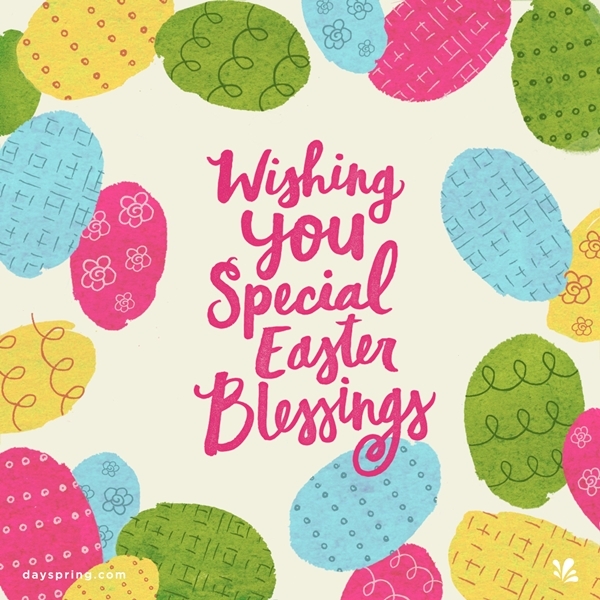 Take some time to fill up with His joy, hope and peace this Easter season.